A few weeks ago The New York Times ran a recipe in the dining section giving rhubarb the credit it has long been due as a vegetable to be used in savory recipes rather than drowning it in sugar for use in pies, tarts, and ice creams. I imagine that if rhubarb could speak, it would tell us how freaking tired it is of being paired with strawberries. Now, with a newfound purpose, its tartness lends itself to a dish much like a squeeze of lemon juice, creating a bright contrast to something that would otherwise taste much flatter with its omission. You may have noticed that this chicken recipe I got here has no mention of rhubarb, and that's because it has none. You see, I had never actually intended on making that specific New York Times recipe. But one day at the farmers market, I saw a berry farm selling some of the most gorgeous fresh currants I had ever laid eyes on. I tried some samples and calling them tart would be an understatement. They were lip puckering-ly, eye widening-ly SOUR SOUR SOUR. However, they were beckoning me with their pearly red and white colors and I just could not resist, so I bought some even though I had not a clue what I would use them in. At the same stand, I also picked up some tart but slightly sweet gooseberries just for shiggles. So with three boxes in hand I got home, remembered the rhubarb chicken recipe, and thought (hey!) I could do the same thing with these sour berries. Then I added other things that I liked and left out things that I don't like so much, I pretty much butchered their recipe, but what came out was something that, as Phillip put it, "made me feel like a king." A few more tweaks and tests later, and I have a chicken recipe that (in my fatty fatpants opinion) is second to only buttermilk fried chicken. If you are in or around Manhattan, you can usually find fresh currants and gooseberries at the Union Square Greenmarket. I have also seen them at Whole Foods. If you can't find them, you can alternatively use any sour fruit or vegetable of your choice. Next time I think I might try out sour cherries and adjust the amount of honey as needed. Salt and pepper chicken pieces on all sides. Let sit for 15 minutes to allow the salt to penetrate. 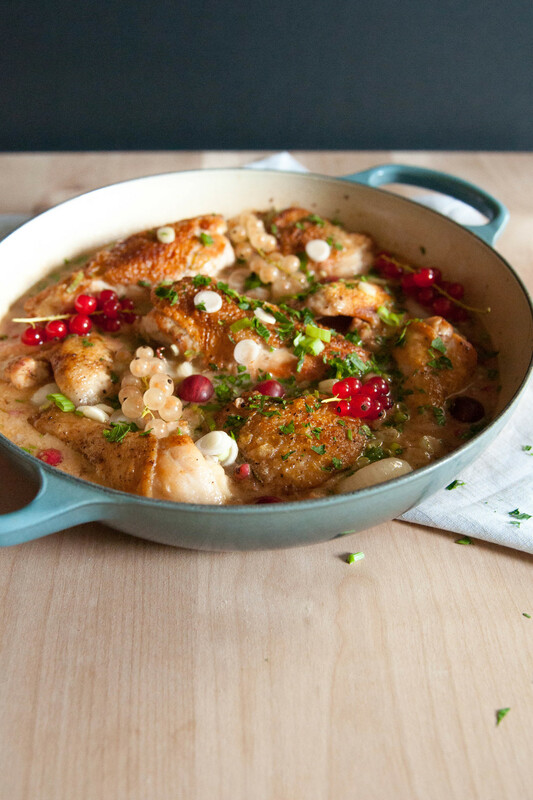 In a large cast iron or stainless steel pan, heat up olive oil on medium high and place chicken in, skin side down. Sear for about 12 minutes, turning once halfway through, until skin is golden and crispy. Transfer to a clean plate. To the same pan (drippings, chicken fat, and all), add onions and rosemary. Cook for 1 to 2 minutes. Add garlic and cook for 1 more minute. Add white wine to deglaze the pan then add currants, gooseberries, and honey. Stir to combine and cook for an additional minute or two until the berries have burst. Taste sauce, and adjust sweetness as necessary. Turn the heat down to medium low and return chicken pieces to the pan, skin side up. Cover and cook at a simmer for an additional 15 minutes or until completely cooked through (for a 3.75 lb chicken, 15 minutes was such that the chicken was completely cooked but still tender and juicy, adjust times as necessary depending on the weight of the bird). Turn off heat, garnish with scallions, parsley, and reserved berries. Eat immediately.